A new hack allows people with a Roomba and some extra time on their hands the ability to create custom Doom maps. 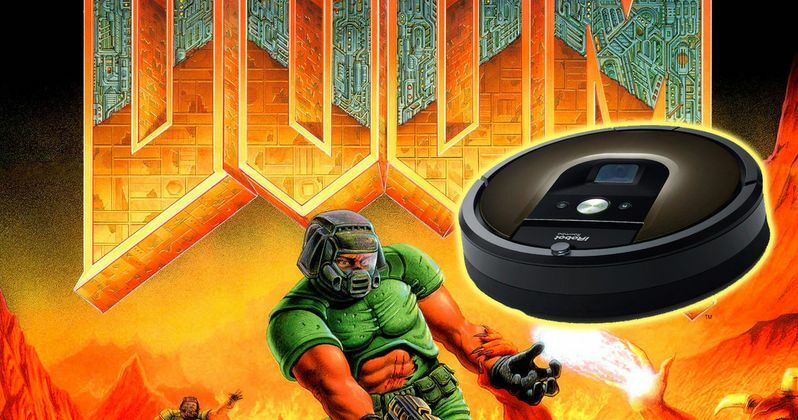 Developer Rich Whitehouse created a tool that he calls "Doomba" that can take floor map data from the Roomba and convert it into new custom levels for the iconic first-person shooter. This should be some pretty exciting news for gamers that have always wanted to turn their house into the perfect place to kill waves of zombies. With some tinkering, Doom fans can have the Doomba module take the digital maps created by the Roomba's own internal software and have them converted into new dungeons. Rich Whitehouse, who is responsible for some of the work on Prey and Star Wars Jedi Knight 2: Jedi Outcast, offered up some pretty humorous reasoning for coming up with the idea. Whitehouse had this to say about the possibly evil Roomba hack. "I soon realized that there was a clear opportunity to serve the Dark Lord by conceiving a plethora of unholy algorithms in service to one of the finest works ever created in his name. Simultaneously, I would be able to unleash a truly terrible pun to plague humankind. Now, the fruit of my labor is born. I bring forth Doomba, a half-goat, half-script creature, with native binary backing for the expensive parts, to be offered in place of my firstborn on this fine Christmas Eve." The Roomba hack is currently only working on the 980 model, which utilizes the newer technology of sweeping the room instead of ping-ponging across it. This feature allows it to efficiently clean the house in a comprehensive manner, while also scaring your pets. Additionally, that new technology allows the Roomba to easily make better maps of the rooms in the house, allowing for more accurate Doom maps while running Doomba. For techno wizards, you'll have to install the Doomba software into the Roomba, install the script, and then tinker with the IP of the device. Once that's complete, you can throw all of that info into Rich Whitehouse's Noesis to run the program and create the new Doom levels. All of the directions seem simple enough for those who have a background in running scripts and some basic programming. The Doomba name has been around for quite a while, but this is the first time that it has become a real-world application and not some clever article about a murderous vacuum. It will be interesting to see if gamers take on the challenge of creating new Doom levels in their homes or perhaps even larger areas like offices or even the outdoors. We could see a new evolution in the creation of custom Doom maps, allowing others into your Doom home makeover. You can get more information and see some of the tests below, thanks to Rich Whitehouse's Twitter account.